I took two days off from my Actual Real Job to work on the window trim and siding on the house, which actually ended up being 112 trips up and down a ladder– seventy of which were doing things that I thought I paid other people to do. For those of you who’ve been around this site since March, you know that I had my little heart set on framing in the addition ourselves, but that time, sense, and MysteryMan got the better of me and we ended up paying a framing crew to knock out the first part of the build in a few weeks. Let me restate that: We ended up paying a framing crew almost $10,000 (not materials, just labor) that was supposed to go to flooring and appliances… things we decided to hold off on purchasing because we thought having professionals do the first part of the build was going to save us headaches down the road. And while I don’t have one bad thing to say about the framing of the house (except for that part where the old joists and new joists don’t line up in the basement so we can’t run ductwork down there to the master bedroom), I definitely did not get my money’s worth when it comes to the window installation done by the professionals. I’ve never installed windows before, but they were level, they opened, and they seemed securely in place, so hey, I had no complaints. But before we went and slapped some trim and siding on the house, I did my due-diligence and read the window installation manual. 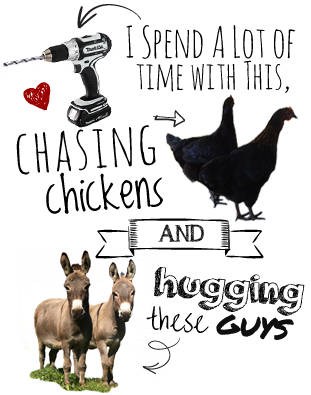 So, what we’ve learned is…. 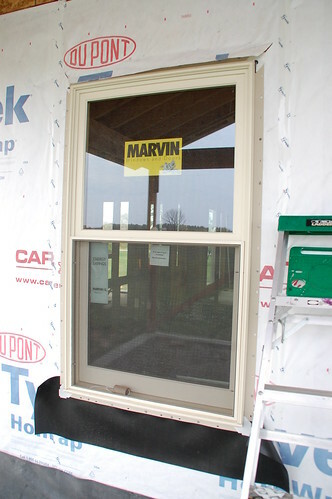 The house wrap should be cut in such a way so that the sides and bottom can be folded in to the house, and the top is lifted up while the window is installed. 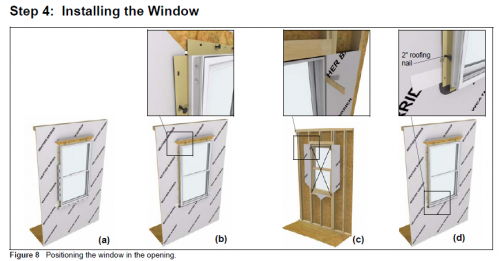 Flashing is put at the bottom of the window. 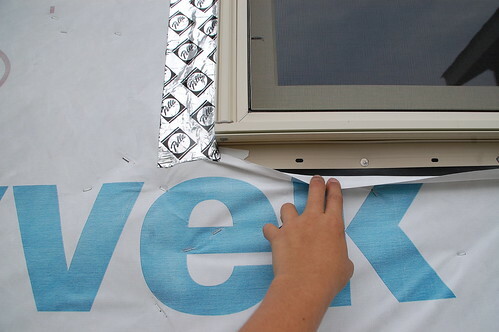 Flashing tape is put around the sides and top of the window. The top flap of housewrap is folded back down over the top flashing tape. And here’s where my life started to get complicated. In my hunt for corner pieces, I find some “corner piece instructions” which specifically say that these must be caulked at the seams. (See my horrible caulk job above. My excuse is that I was on an unsteady ladder. Ahem.) None of the corners have been caulked by the people that installed the windows. Result? 28 trips up and down the ladder. 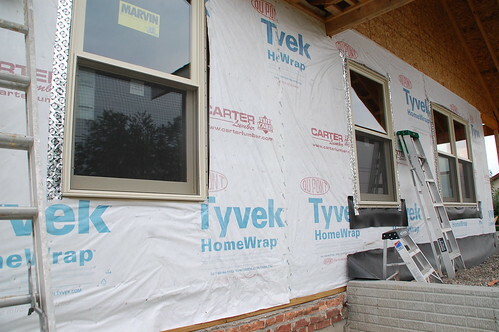 Six of my 14 windows have been installed so that the top flap of house wrap is nailed behind the window. 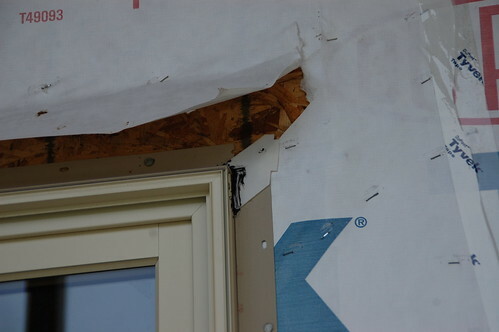 The part that’s supposed to go over the flashing at the top to prevent water leaking down the backside of the window. So this is awesome, and another 15 trips up the ladder, pulling out staples and cutting new pieces of house wrap for the top. So my day that was supposed to be spent putting on window trim, was actually a fun-filled 8 hours of caulking, taping, and hauling myself up and down the ladder almost thirty more times to put tape over the nailing fin. That I don’t have to go back and re-do work that I paid you to do. That what you do is done right. So when I saw this, my head basically rocketed off my shoulders and spun around in the lower atmosphere. Here’s a game called “what’s wrong with this window”. It’s kind of like photo hunt. Do you see something different between these two? Flashing! Hidden underneath the house wrap for some reason. I mean, first of all, it’s one thing if you don’t know what you’re doing, but there are two windows here, side-by-side, that are clearly done differently. Common sense would tell you one of them has to be wrong. Right? Am I just talking crazy here? 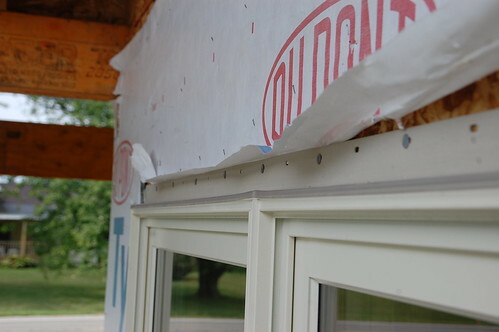 Also, if you just stop for a minute to consider the point of flashing, which is to direct any water running down the inside of the window away from the house, I think it makes a lot of sense that you’d want that on the outside of your housewrap. 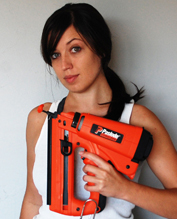 Instead of directing moisture right down your sheathing and into the basement. 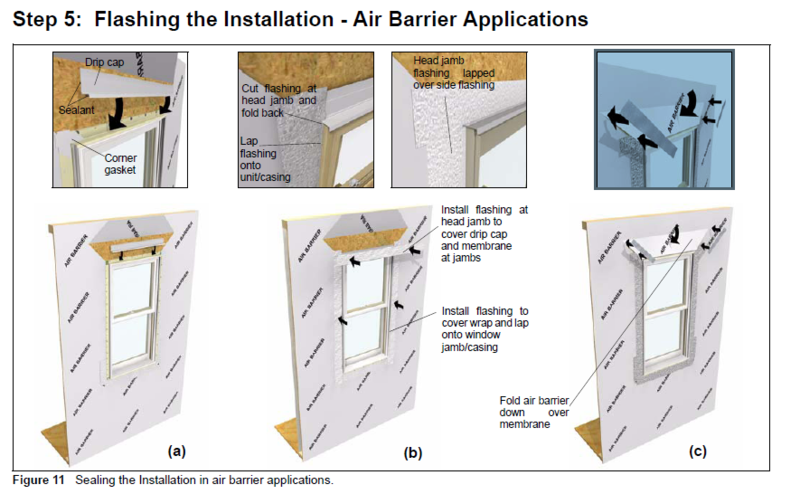 I read articles all the time that are all about “projects you need to get professional help for” and “why you shouldn’t DIY”, but here’s the thing, I can read the installation manual as well as anyone. And if I hadn’t done that, or hadn’t been personally trimming out these windows, I might never have noticed that they were improperly installed. And three years from now I’d be wondering why every time we get a sprinkle I’ve got waterfalls pouring in from my windows. Moral: Just because you hire someone to do the work, doesn’t mean you should slack on doing your research about proper installation techniques. Also: God bless the internet. OMG. You paid them, you need to get them out there to fix it, show them the pictures or have them give you a partial refund. The workers are just being lazy, is my guess. If you talk to the boss man, he’ll know that it was done incorrectly. When I was in architecture school, I also worked part time at an architecture firm that specialized in water retention prevention, basically designing flashing / siding for specialty jobs (lots of rain in Seattle) and most of our work was just ripping out all the windows and doors of shoddy work and fixing them, that always turned into ripping out entire walls and floors because of all the dry rot the water intrusion caused, just from the flashing / wrap being installed wrong! What company did this? I need to be sure I never use them! Sadly, that’s about what I expect from most companies these days. If it were me, I’d send them an itemized bill for my time and materials. That’s horrible. If I ever hire out for any work on my house, I’m definitely going to look at the instructional materials and sit perched on the worker’s shoulder the whole time – if I can help it! Um, yea, take these pics, go to their supervisor, and demand a 10% refund, or you’ll report them to the local buidling inspector. That will have them jumping outa their pants. Get a refund, honey, no need to stand for shoddy work, especially when you work hard to pay for it. Besides you’re a chick, and they prolly thought you had no clue about this stuff! I’m so mad right now! I had to calm down and remind myself that is not my problem (as in you don’t need me to call the installation company for you- but I totally would!). I hope you work something out with them. Also, good for you for double checking everything and making the fix now. OMG I would be livid!! Seriously, go after who did that to your windows! Can you imagine all the rot and water damage that could have caused in the future had it gone undetected? Not right they need to come fix the problems. 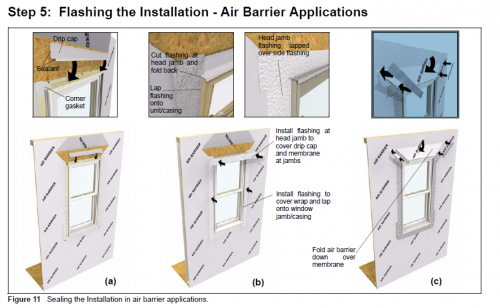 all windows can be fixed fast and easily with a product from Grace, it’s a self sticking flashing used under low pitch roofs to help protect from water dams. But make them do it! I love all of you for being so irate on my behalf. I spent one of my days off with steam coming out of my ears, fixing the mistakes and properly flashing the windows so that we could trim them the next day… no time to wait around here! Unfortunately we hired a crew that a friend of ours works with sometimes specifically to have him on the job, I have a feeling the windows he did are the right ones, but I’m still going to have a “little talk” with him about it. Wow, I would be SO angry. I concur with Jessica – ask for a partial refund – *specifically* ask for a refund totaling the amount on an itemized bill for my time and materials. Wow…I can only imagine the water damage and resulting mold…talk about a health hazard!! And the cost it would have imposed on your wallet to fix it later, rather than it having been done right the first time. Unfortunately, this seems to be a common problem. At my firm, we dedicate an entire sheet to proper window flashing details that include step-by-step diagrams and everything (who knows if the installers actually look at it). Definitely sounds like there was a QC oversight…and a “little talk” can’t hurt. curious how this worked out after your “little talk” with your friend. clearly the contractor should foot the bill on a job like this. best practices weren’t followed, neither were manufacturers’ recommendations. total fail.